The local sharemarket has closed the week lower after a global sell-off pushed Australian shares to their lowest level in 12 months. 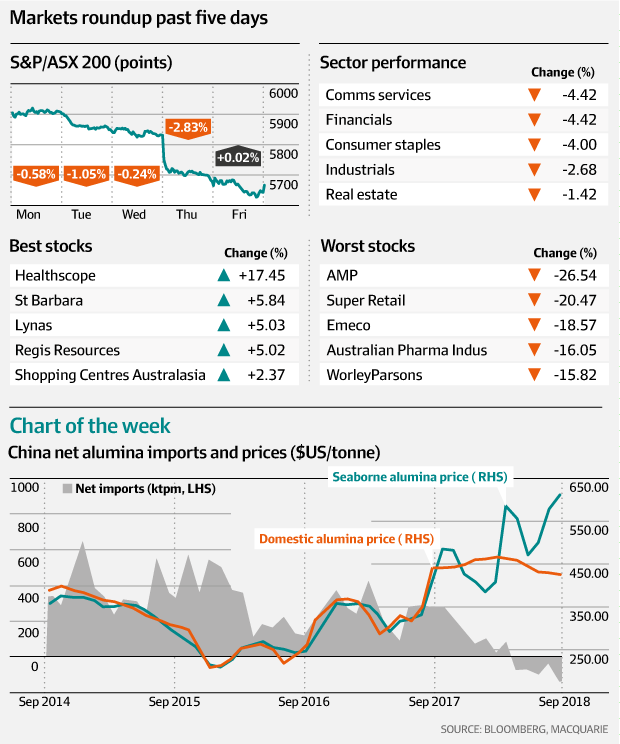 The S&P/ASX 200 index fell 274.3 points, or 4.6 per cent, to 5665.2 this week, as local shares entered a technical correction on Thursday. The major resource companies led the market lower this week, with index heavyweight BHP Billiton falling 5.7 per cent to $31.20 this week. 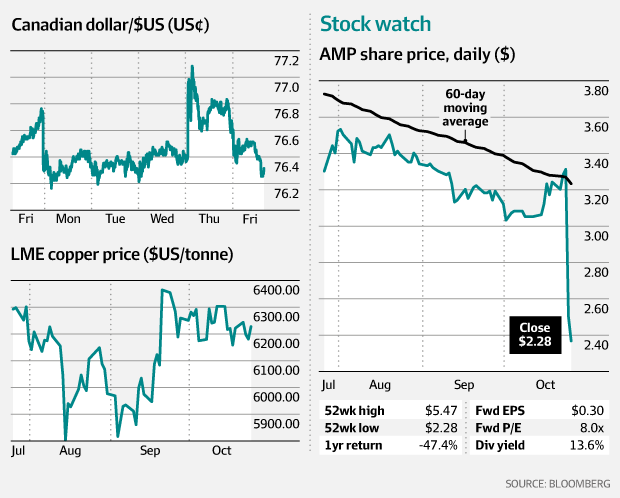 Rio Tinto fell 4.2 per cent to $74.16 and South32 closed 6.6 per cent lower at $3.51. The energy sector was hit on two fronts this week, as oil prices softened to a two-month low and the government announced greater regulation over how much energy providers would be able to charge customers. Woodside Petroleum fell 8 per cent to $33.26, Origin Energy slid 12 per cent to $6.95 and WorleyParsons closed the week 15.8 per cent lower at $14.24. AMP took a big hit to its value this week after the embattled financial services giant announced it will sell its life insurance division to overseas player Resolution Life for $3.3 billion and will shed its New Zealand wealth management and advice business. Its shares fell 26.5 per cent to $2.38. The major banks also closed the week lower, hurt by weak investor sentiment. Commonwealth Bank closed 3.1 per cent lower at $65.81, Westpac fell 3.3 per cent to $25.96, ANZ slid 4.3 per cent to $24.91 and NAB went down 3.8 per cent to $24.70. CSL was also among the index’s biggest weights this week after falling 5.9 per cent to $176.90. The healthcare giant has wiped a quarter of its value since the start of September. Healthscope shares soared after private equity firm BGH Capital has made a surprise $2.36 a share second bid for the private hospitals operator. The company’s shares ended the week 17.5 per cent higher at $2.12. Rare-earths miner Lynas Corp announced record revenue this week as part of its quarterly update, helping it to close the week firmly in the black. It closed 5 per cent higher at $1.78. Market volatility pushed investors towards precious metals, lifting the price of gold this week. Locally listed gold miners responded this week, with most closing Friday in the green. St Barbara lifted 5.8 per cent to $4.35, Newcrest Mining closed 0.4 per cent higher at $20.76, and Saracen Mineral Holdings climbed 2.1 per cent to $2.44. Despite AMP wiping almost a quarter of its value on Thursday, Morgan Stanley retained its overweight rating on the stock, saying that while the sale of and planned exit from value assets was costly and complicated, it would simplify the business in the long term. “The deal creates a simplified AMP for incoming CEO Francesco de Ferrari to rebuild,” the broker said in a note on Thursday night. “Exiting capital-intensive, run-off assets positions AMP as a relatively capital-light, higher-RoE, growth business focused on wealth management, asset management, and retail banking.” It said the recent sell-off overlooked the potential for capital initiatives and the cost-out opportunity. “The stock looks oversold and value attractive,” it said. The broker adjust its valuation on the company, lowering its target price from $4.25 to $3.40. China’s alumina exports hit a record high during September, signalling that the country’s transformation from a net alumina importer to a next alumina exporter in the past few months has been successful. The transition, which began in May this year, came off the back of shortage concerns in the seaborne alumina markets. The alumina market has faced a tough year this year, with a number of supply risks hampering its performance in the past few months. Limits to production at Norsk Hydro’s Alunorte refinery, US sanctions against Russian miner RUSAL and strikes at Alcoa’s alumina refineries in Western Australia all moved the price this year. Copper prices rose on Thursday on the London Metal Exchange, as copper inventories at LME warehouses fell to their lowest level since 2005. There have been rising order to withdraw copper from LME warehouses recently although the price of the base metal has stayed relatively consistent, rising just 1.1 per cent for the month. Copper inventories have fallen more than any other metal in London in the past few weeks, down 60,235 tonnes for the past month. The price of copper fell to a low of $US6113.50 a tonne on Wednesday, its weakest price in two weeks following Wall Street’s tumble, before recovering slightly on Thursday. The Canadian dollar dipped away from a one-week high on Thursday, unwinding the boost it had received on the back of the Bank of Canada interest rate hike the day earlier. The loonie hit its strongest intraday level in a week on Wednesday after the country’s central bank raised interest rates and indicated it would speed up the space of future hikes, due to the fact the economy was running at almost full capacity. The Canadian dollar has been trading with some volatility this year. While it started the year trading above US80¢, it has since slipped to be trading around US76.40¢.